I want to present my project: it's a small dock (same size as the mini dock and the omega) for the Onion Omega 2 and 2+. Here's what i came up with, i called it dock\new. It has an onboard linear voltage regulation (i didn't bother going with a switching one for such low power), magnetics integrated in the RJ45 connector to save space, USB host ESD protection (diode array), USB host PTC fuse. The first version, which you see in the photos, had some issues with the ethernet. 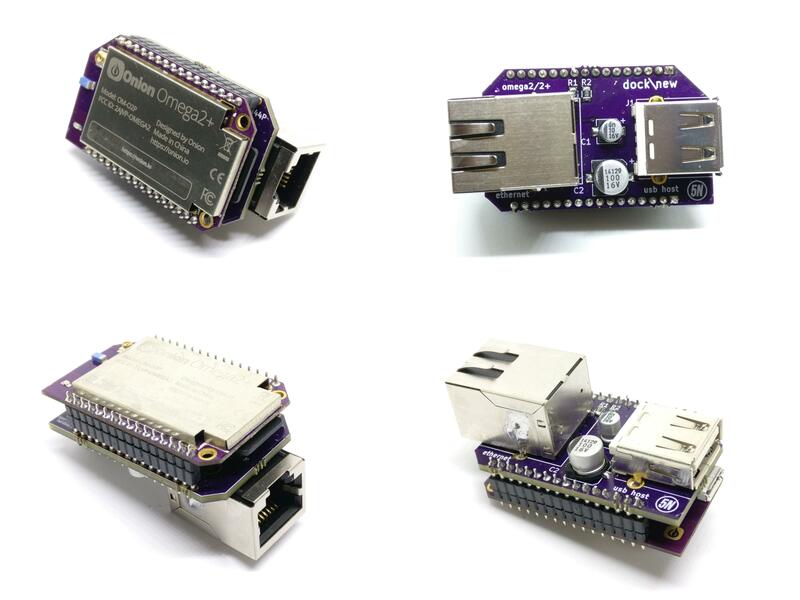 Currently i've released v1.0 that solves all the issues, adds a led to check power and, making a better use of the space, the RJ45 connector doesn't protrude anymore. I haven't ordered the v1.0 PCBs yet, but the circuit is tested. I've chosen 0805 passives, 1206 ptc fuse, big smd electrolitic caps, a SOT223 (the classic 1117) for power regulation and a SOT23-6 for usb host protection, so it can all be easily handsoldered with just a plain soldering iron. Probably the hardest part to handsolder is the SOT23-6 but it's easily doable by hand. The components and board cost for the prototype it's arround 10 to 15€ per board. It would go down with bigger volumes. The project is open source (CC-BY-SA 4.0). 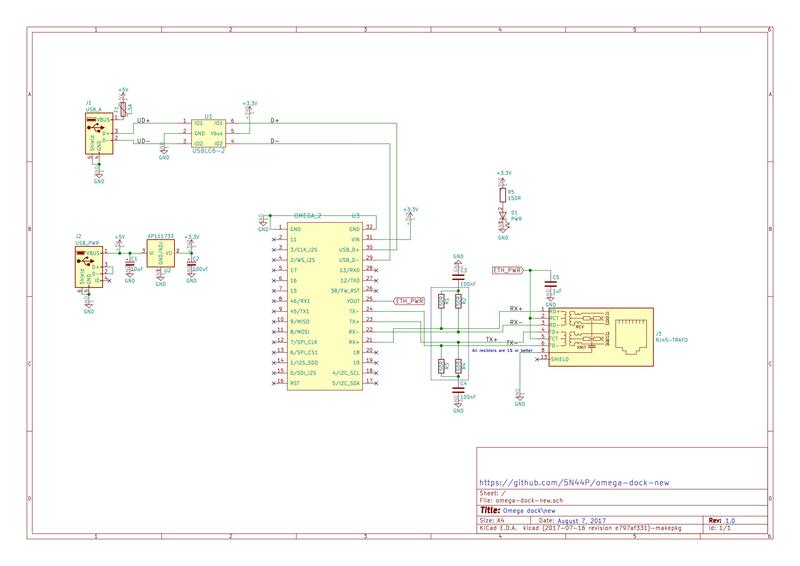 KiCad schematics, board layout and the other files are available on the github repo. If anyone has some suggestions please comment! Just a comment, if I may. From what I know with Omega2 and Ethernet, the ETH_PWR signal should actually be disconnected (central taps of the magnetics just grounded through the 1u capacitor). Have you tested it as on the schematics? Did it work? That's the tricky part, where i've had most of the issues. In the original schematic from omega, the NEW_POW net is connected to pin 25 (the VOUT pin in the pinouts). In my first desing i thought that tieing the central taps and the VOUT pin to 3.3v can make the things simpler. Turns out that the ethernet doesn't work at all if you do that. So i've bodged in some wires and cut some tracks, to test it with the original ethernet expansion schematic and it works fine. I will also test it with the center taps connected only to the cap. The other issue i've had is that normally J1 and J2 from the ethernet cable are connected to the TX pair, on the omega 2/2+ they are connected to the RX pair. I've tested both configurations (J1-J2 to TX and J3-J6 to RX, and vice versa) and both work fine, but i don't know if the omega has its own auto MDI-X or it's just my network equipment. Anyway in the pinouts the purpose of the NEW_POW/VOUT pin is not clear. The design i published is what i'm using right now, tested and working. @Valerio-Backslashnew Perfect reply. Those are exactly the same issues Im coming across. In Omega2, although that PIN is labeled as Ether_Power, there is no internal connection (N/C), so it is as good as "does not connect" to anything or "just floating". @ccs-hello So it's unnecessary to connect the center taps with VOUT pin? It's enough to connect it to the capacitor? looks like a nice board. i'm wondering if you have any plans to have some fabrication[pcb] firm make a batch and you sell them or at least offer for sale through the pcb firm.? Maybe i can also make a small batch of boards with all the components soldered so that who can't solder, can still get his own. So it's unnecessary to connect the center taps with VOUT pin? It's enough to connect it to the capacitor? @valerionew hi. if you get the bugs worked out of the board and either you have them for sale or the pcb place has them for order i would be interested in at least 1 and maybe a couple more depending on cost or, if you can make a kit with all the components un-soldered that would save the cost of getting all the pieces i don't have available here that would be good. if all you plan to offer is soldered units then 1 of those if you can keep the cost relatively low. pros: very nice! i need 1-3 of them. cons: hard to use GPIO without soldering. @Douglas-Kryder and @Andrii-Petrenko if you want multiple boards i can recommend you to get them from OSHPark. They've done a really good job with v0.9, plus their boards are purple like the omega. I've already uploaded the board here. I have to remember you that the v1.0 is not tested yet, so proceed at your own risk. The same circuit with bodges works on v0.9 but you never know what can go wrong. Also, i'm trying to contact some chinese manufacturers to get their best price for the RJ45 connector with magnetics, which is the most expensive part in the project. I'll let you know if i can get their attention and an offer for such low volume. With the omega 2 you should be able to place 2x8 pins. With 3.3v and GND, that's 14 GPIOs. On the omega 2+ there is the SD card there, so unless you somehow raise the two omega strip connectors (there is some extra pin lenght on the strips i used), you will be able to place only 1 row, giving you 6 GPIOs available, plus 3.3v and GND. And, of course, thank you to the onion team for featuring my project into the newsletter! @Me-Too I've just replied to an issue on GihHub with (i hope) all the answers you need. I don't know if that one is also from you or not. If i've not answered all your question, please ask! Here or on GitHub. Yes, @valerionew, you're right that I asked in both places. I created a gist before I found this, and decided it might be useful to have it here, too. Thank you so much for the answer and listing the equipment you have! I doubt I'll buy what you have (sometimes I'm cheap about the wrong things, but I won't use these very much), but it's great to see the actual equipment to see if what I have might suffice. My fear of SMD is due to previous experience where the contacts and pads were completely obscured by the part. That made baking (which I read an article once about doing smd that way) or possibly hot-air, but only sometimes on the air. @Douglas-Kryder Thanks to you too...the solder paste seems like a great, and easier idea, even though I've never used it. I'm glad it's 3 packs, so I can still get 2 if I screw up the first attempt! Oh, and I'm placing the order now, so maybe that will help get them quicker. @Allnight , forgot to mention that there are many videos on youtube that show methods of smd soldering. I'm using a 0.1uF instead of 1uF capacitor to ground the center tap of the transformer, but i don't think that's significant. If you happen to have a 0.1uF 0805 capacitor instead of 1uF, don't bother buying a 1uF one.